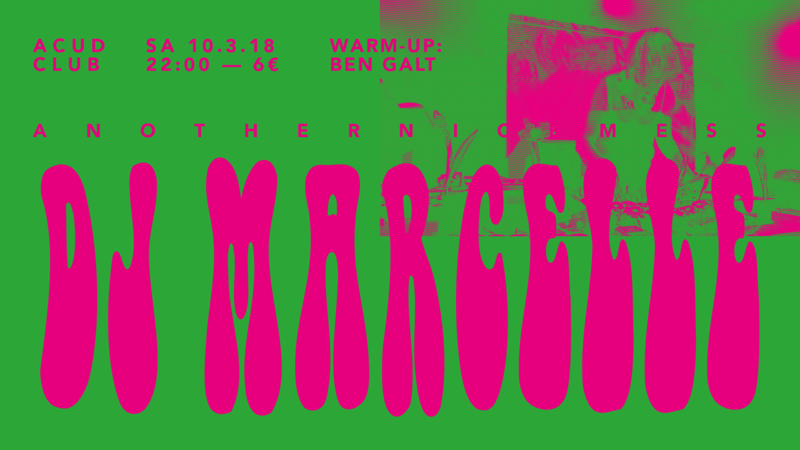 After her epic set last December, Dutch DJ and producer Marcelle is back at our Club! Prepare for excellent genre-defying dance music. Local support courtesy of Berlin Community Radio's Ben Galt. Surprise, adventure, entertainment and education: Four key words often used for describing Dutch DJ and producer Marcelle/Another Nice Mess. Using live (and in the studio) three turntables, Marcelle takes her mix talents to high heights. She is as much, or even more of, a musician as she is a DJ. She is an original, skilled mixer, with a very distinctive style of her own, avoiding most DJ-cliches and stale rules. As much inspired by avant garde art movements as fluxus and dada, the real life absurdism of Monty Python as by the wild experiments of dub, post-punk and the latest developments in electronic dance music Marcelle has always been following musical developments very closely and has a keen ear for innovative and new sounds. She strongly believes in the excitement and artfulness of creation and development. With her extensive record collection of some 20,000 vinyl and counting, Marcelle has a strong historical knowledge of past and contemporary underground music. She also produces her own music; on the German label Jahmoni she has started putting out a series of vinyl only releases. Marcelle also does weekly and monthly radio shows for various radio stations in Europe.